Situated in Iredell County, Mooresville is on the northern edge of Mecklenburg County and Lake Norman and has been a fast growing area for over a decade. Mooresville is the proud home to home-improvement giant Lowe's Corporation, the NASCAR Technical Institute and the North Carolina Auto Racing Hall of Fame. Mooresville is home to more race car teams than any other town in America! In fact, the town nickname is Race City USA. 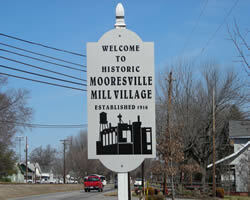 To learn more about the Town of Mooresville, click here. John Franklin Moore founded this town in the mid-1800s. The need for a depot along the new railroad route from Charlotte to Statesville was the stimulus for the town's origin. Nowadays, Mooresville is rapidly expanding with the influx of a variety of businesses. And with downtown Charlotte only 30 minutes to the south, anything you could want or need is readily available. Iredell County's low taxes and well regarded schools are a big factor in drawing people to the region. Mooresville is a wonderful place with residents who take pride in traditional American values. Looking for Mooresville homes for sale? Search our local listings database for access to listings in Mooresville and surrounding areas. Whether you want to buy or sell Mooresville real estate, you can browse through properties or find a wide variety of real estate resources available on this website. If you are looking for a Mooresville REALTOR®, choose Debbie Sloan! As your Mooresville real estate agent, Debbie Sloan can assist you with all of your home buying and selling needs. I can provide you with access to the local listings database and offer our experience and knowledge to make the home buying or selling process easier for you and your family. Contact Debbie Sloan today to get your home search started!